Sunlight contains ultraviolet light that can have significant deleterious on human skin. Aside from skin aging these energetic light waves produce mutations in the DNA of skin cells which can accumulate to produce skin cancers. The incubation period can extend to decades. In areas close to the equator inhabited by individuals with poorly-pigmented skin, the incidence of cutaneous cancers is dramatically increasing. 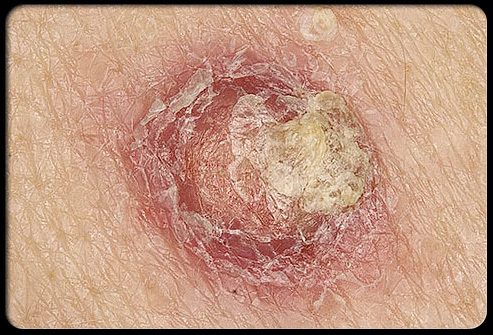 Since skin cancers are composed of masses of cells the most consistent warning sign is the development of a persistent bump or spot in an area of sun-damaged skin. Since these cancers require a blood supply they often exhibit small friable feeder vessels which are likely to bleed with minimal trauma and produce a superficial erosion. Actinic keratoses are a rough scaly patch on your skin that develops from years of exposure to the sun. It is most commonly found on your face, lips, ears, back of hands, forearms, scalp or neck. An actinic keratosis begins slowly and usually causes no signs or symptoms other than a patch or small spot on your skin. 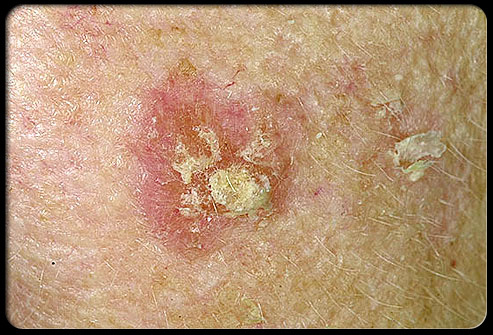 A small percentage of actinic keratosis lesions can eventually become skin cancer. You can reduce your risk of actinic keratoses by minimizing your sun exposure and protecting your skin from ultraviolet (UV) rays. Limit your time in the sun. Especially avoid time in the sun between 10 a.m. and 2 p.m. Use sunscreen daily. Apply a broad-spectrum sunscreen. The American Academy of Dermatology recommends using a broad-spectrum, water-resistant sunscreen with an SPF of at least 30. A cutaneous horn is a mass of dead skin cells. Essentially they have a lot in common with hair and nails since these are also composed of dead skin cells. 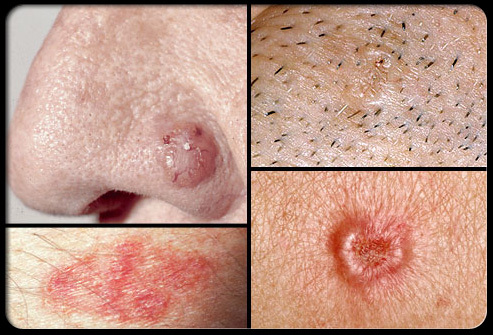 The base which generates the horn can be an actinic keratosis, a squamous cell carcinoma, or a benign keratosis. The only way to differentiate between the three is by performing a surgical procedure called a biopsy and having it examined by a laboratory. 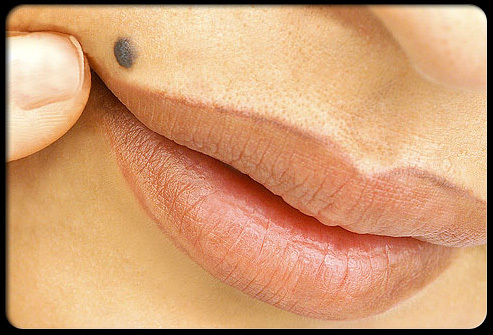 The word “mole” is probably derived from a German word meaning spot. When used in a cutaneous context it often refers to a spot on the skin. Since there are a variety of benign and malignant skin growths which fulfill this description, more precision is necessary. 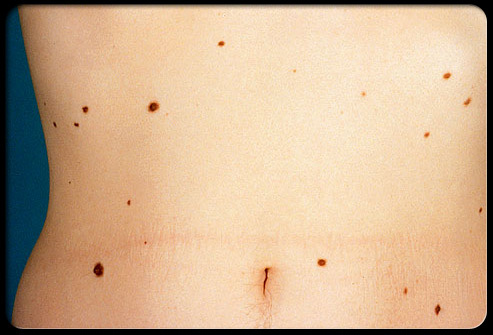 Moles that are melanocytic nevi (nevus singular) are local growths of melanocytes which can be present at birth or may develop after birth well into the third decade. They vary in color from black to flesh-colored. 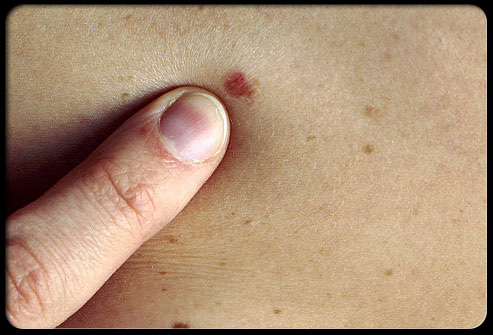 The number of moles present on a particular person is most closely related to skin color and the extent of exposure to sunlight during childhood. The average number of moles is about 35 per person in Northern European populations. 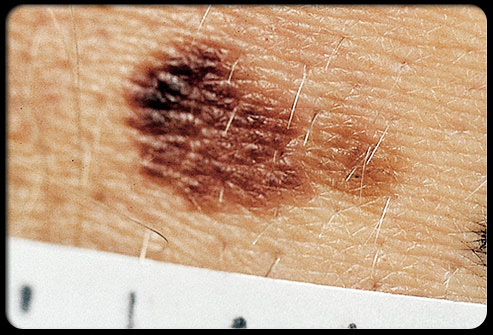 When a physician examines a particular nevus it can appear either ordinary or peculiar. The degree of peculiarity for better or worse has been called “atypicality.” This is a very imprecise descriptive term. There are families whose individual members have a great many very peculiar nevi and have a genetic predisposition to develop cutaneous melanomas. 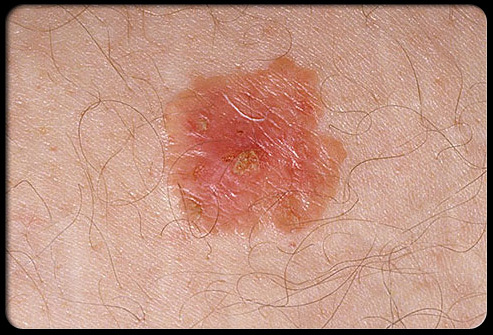 Most of these atypical nevi — when examined under the microscope — are not cancer; it seems to be the new lesions that develop in adulthood that are the ones that are most likely to be malignant melanomas. The term dysplastic refers to changes noted in moles that can only be appreciated on microscopic examination. This term should only be used when describing the microscopic appearance of a nevus or other tissue. Most atypical nevi exhibit some degree of dysplasia under the microscope. In an attempt to systemize nevus description physicians use a variety of adjectives to describe visible alterations. To simplify things, benign lesions are almost always uniform in color, circular in shape, and exhibit bilateral symmetry about any axis drawn through its diameter. 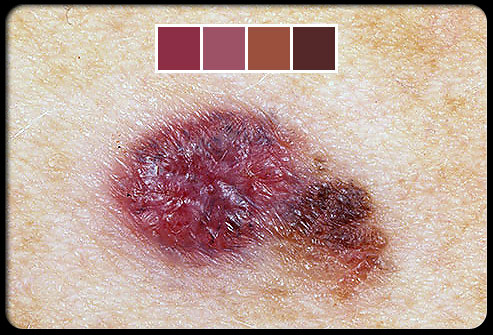 Malignant melanomas diverge from this appearance to a greater or lesser extent. To help one remember the criteria, they have been called the ABCDEs (mnemonic) of nevus description. Another valuable consideration is the so-called “ugly duckling” nevus which appears significantly different than all the other nevi on the patient. Evolving: Malignancies by their very nature tend to change over time — mostly by increasing in size — as opposed to benign lesions that are stable. 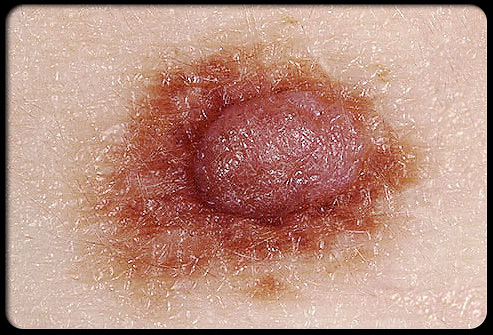 Since cancers grow in an uncontrolled way they tend to produce asymmetrical lesions. 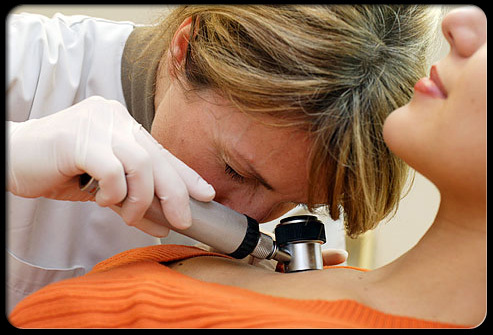 If a mole looks or acts at all peculiarly it is best to have it evaluated by an expert. This frequently is a dermatologist. Most dermatologists can tell if the pigmented lesion is composed of melanocytes or is something quite different with no possibility of being a melanoma. Many dermatologists now use a hand-held magnifying device which produces polarized light to evaluate colored melanocytic tumors. The use of this instrument improves the doctor’s ability to identify suspicious lesions. The decision on which melanocytic lesions need to be examined depends on the concern the doctor has that it may be cancerous. Since the procedure necessary to take off the suspicious bump is simple, requiring only local anesthesia and rarely is associated with complications, the threshold for this procedure is appropriately low. 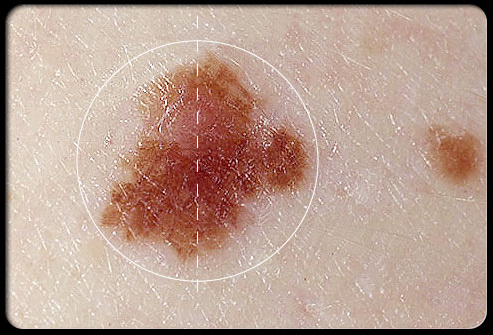 If the lesion is melanocytic in origin and it appears at all peculiar, exhibiting any of the features addressed in the ABCDE criteria and/or the patient complains that the bump bleeds or is irritated or itchy, that is often enough to trigger a biopsy. 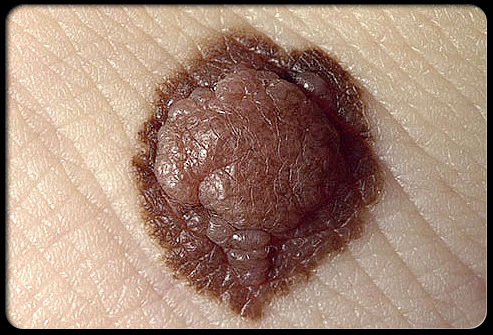 Although it is possible for a previously benign mole to become malignant most of the time a melanoma begins as a single malignant cell in previously normal skin and then continues to grow in an uncontrolled manner. 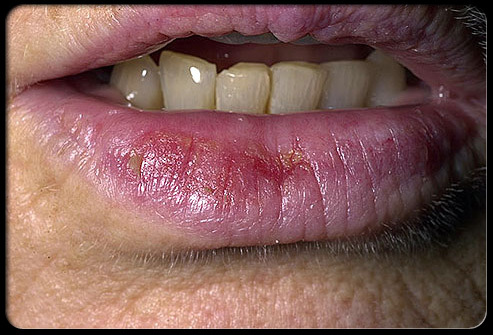 Bowen's Disease typically presents as a gradually enlarging, well-demarcated red colored plaque with an irregular border and surface crusting or scaling. Bowen's disease may occur at any age in adults, but is rare before the age of 30, most patients are over 60. The cells in Bowen's disease are often highly atypical under the microscope, and may in fact look more unusual than the cells of some invasive squamous cell carcinomas. Treatments include cyrotherapy (freezing, topical chemotherapy and excision. Because the cells of Bowen's disease have not invaded the dermis, it has a much better prognosis than invasive squamous cell carcinoma. 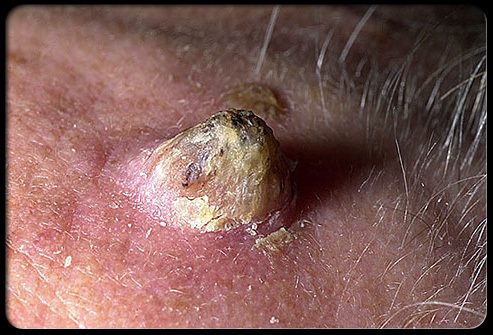 Basal cell carcinomas arise from the layer of skin cells present along the lowest layer of the epidermis and are the most common form of skin cancer. Fortunately they rarely spread to distant sites unless they are permitted to attain gigantic proportions. They are locally aggressive so they ought to be treated before they get so large that removal becomes technically difficult. The tumor has a shiny surface, is pearly white in color, and tends to bleed quite easily. It often ulcerates. Sunlight is by far the most common cause of skin cancer. Most of the exposure occurs during leisure time or as a consequence of a desire to darken one’s basic skin color. The perceived benefits of exposure to sunlight seem to be confined mostly to the production of vitamin D in the skin, a belief that darker skin is more aesthetically appealing, and the warmth produced as the light as hits the skin. Vitamin D requirements can be easily satisfied with dietary supplementation. Light-skinned individuals with blonde or red hair who live in regions near the equator are most likely to develop skin cancer. It is important to avoid exposure to sunlight as much as is reasonably possible. Any time there has been a darkening of the skin after sun exposure it is a sign that some damage has been sustained. Since the incubation period for skin cancers and photoaging is quite long (5 to 15 years), it may be difficult to convince sun worshipers of the foolishness of this behavior. The use of clothing, searching for shade, and the application of effective, broad-spectrum sunscreens are all useful behaviors in limiting photodamage. Sunscreens that block all the wavelengths of ultraviolet light with an SPF (Sun Protection Factor) of 50 and that are reasonably durable are currently available. 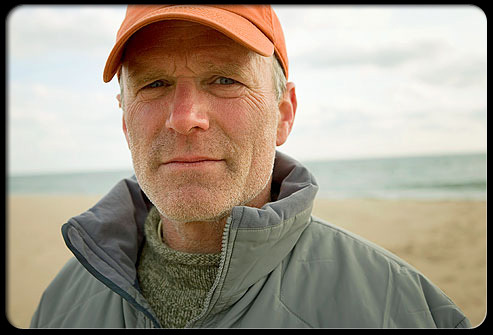 For More Information on Skin Cancer Awareness, Prevention, and Treatment.